Favourite Movies/TV/Books: "Wings Of Desire", 'Bullet Park", "In Dreams Begin Responsibilities", "Perdido"
Colin is the Radiohead bassist. 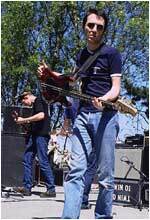 And while he's not the most obvious outstanding bassist in the entire world, his style does suit Radiohead perfectly. I don't think any other bassist could take his place in this band, because it just wouldn't work. The continuous fast 'boom' he adds to songs like The National Anthem, and Dollars & Cents are vital to how the song comes across. He can change the way a song sounds entirely, such as Planet Telex (which would be nowhere without a bit of decent bass), and can also sit back and add simple yet significant touches to beautiful melodies. A good example of this is Street Spirit [Fade Out]. A bassist is required in a guitar band. He's not the most talented bassist to ever walk the earth, but he's the only one that could work well with a band like Radiohead. Such is his style, Colin is a vital foundation for the band to build their songs around. Apparently Colin can't get laid, and is a compulsive liar. But he enjoys a drink and is very strong minded and astute with a good sense of humour. He's also downloaded a library... So Thom reckons. See Colin's Page at Radiohead.com.